This traditional eight-course certificate program is ideal for individuals who are considering a career transition into the financial planning profession or for current financial professionals who wish to expand their knowledge and career prospects. The program fully meets the educational component for CFP® Certification, covering the topics that form the basis for the examination. Students must successfully complete all eight courses in the certificate program as well as the one-day seminar, Ethics in Personal Financial Planning, which can be taken at any time during the program. Students can complete the required curriculum within approximately two years of study. Click on the respective course title(s) to determine course availability and to enroll. Submit an Application for Candidacy with a non-refundable application fee of $200. Students are recommended to enroll in the certificate program after completing the two introductory courses in the program. Complete all eight required courses for a total of 32 quarter units. Receive a minimum 2.5 GPA or better for courses completed in the certificate. Complete within five years all of the required courses. 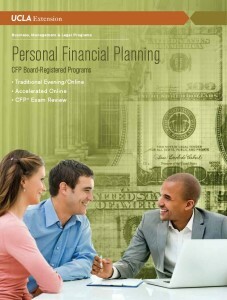 For students planning to sit for the CFP® Certification Examination, it is recommended that the program be completed within a two-year time period. There are no academic prerequisites required for this certificate; however, students are encouraged to have general knowledge of accounting principles, business economics, and statistics prior to enrolling. A maximum of two courses can be transferred into this certificate program. Courses must be equivalent in course content and unit value to be eligible, and must have been taken within the last five years. If courses were taken beyond this time period, students may be allowed to take alternative courses in consultation with the Certificate Programs Advisor. Course requirements will not be waived based on previous work experience. Courses in this program have been approved for Minimum Continuing Legal Education (MCLE) credit by the State Bar of California and may also be applied toward the State of California‘s continuing professional education (CPE) requirement for the licensure of Certified Public Accountants.